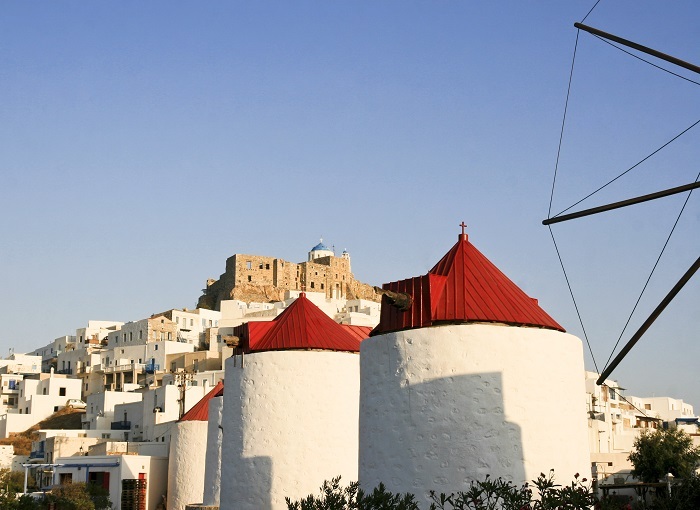 If Mykonos is the island of the 6000 strong Greek Archipelago most suited to modern-day jet-setters, butterfly shaped Astypalea is for those who, like regular visitor to these parts Greta Garbo, are happier beating a less trodden path when escaping to the sun. On this blissfully private island, you have 19 pristine beaches from which to choose a secluded spot, even at the height of summer. Dining at one of the family-run restaurants is among Astypalea’s delights. The cuisine is modern, sophisticated and light, and made from locally sourced, fresh ingredients. Astropelos, a taverna located by the charming bay of Livadi, is one of the best: if the menu of the day doesn’t suit, the proprietors will rustle something up for you - perhaps the morning catch with a handful of island herbs and spices, a dash of olive oil on the barbecue, some lemon and butter grilled baby squid or lightly pan-fried calamari with home-made bread? Whatever you choose, it will be memorable. The charming Pylaia Boutique Hotel and Spa (www.pylaiahotel.gr), 300 metres above Livadi, is spread up and down narrow alleyways and white-washed steps. Comfort and simplicity converge in the 27 rooms and suites which have soothing white and aqua green interiors. The hotel also boasts an excellent restaurant that offers traditional Greek food with a contemporary twist. Don’t miss out on the crunchy roasted feta with sesame seed, thyme and honey crust on a bed of grilled vegetables and aubergine mousse. Another local delicacy to embrace to the full is the refreshingly breezy approach to life: on this island of 1200 invariably good-natured and highly blessed inhabitants, everything is done mindfully and with grace. If a stopover in Athens makes up part of your itinerary, meanwhile, Hotel Grande Bretagne (www.grandebretagne.gr) - a historic, grand hotel that's retained its old world romance yet not compromised an iota of contemporary luxury – is highly recommended. It’s a place where vibrant colours are seamlessly woven into carpets and tapestries; where 17th-century paintings depicting Greek mythology, antique furniture and polished marble floors compete for visitors’ attention. The former mansion of a Greek businessman, and situated overlooking Syntagma Square in Central Athens, after becoming a hotel in 1879 its earliest guests of note were athletes and spectators of the first modern Olympics in 1896. Gary Cooper, Maria Callas, Umberto Eco, Herbert von Karajan and Elizabeth Taylor are just some of the legendary guests to have darkened its doors since then, as was Sir Winston Churchill, who had a reputation as a demanding hotel connoisseur (he habitually re-located his War Cabinet to London’s Savoy during the Blitz). Wherever they turn, guests are met with chic opulence, the apotheosis of which is revealed at the roof terrace restaurant and bar where one can gaze upon one of the great wonders of the world - the Parthenon, so perfectly staged and lit, it looks almost unreal. The most stirring hotel view in the world? At the risk of hyperbole, it may well be a contender.